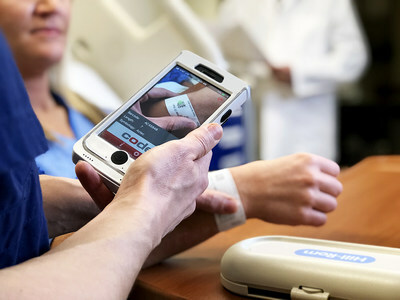 SALT LAKE CITY, Feb. 11, 2019 /PRNewswire/ -- Code, an innovator in healthcare automation and mobile technology, is bringing some additional excitement to the Healthcare Information Management Systems Society (HIMSS) show in Orlando with the release of the CR7000 series healthcare mobile battery case. The durable protector for the iPhone 7 and 8 completely shields your valuable electronics while maximizing uptime with its quick-swappable battery, all in a compact package made to stand up to the toughest disinfecting chemicals. "Health systems should be able to take full advantage of the benefits of mobile devices without having to sacrifice efficiency or infection control," said George Powell, CEO and President of Code. "With the ruggedness and extra power of the CR7000, hospitals can recognize the full potential of a mobile workforce." Constructed with market-leading CodeShield® plastics and Dragontrail™ glass, the CR7000 completely safeguards the iPhone 7 and 8 in an IP54-sealed enclosure. The quick-swap battery more than doubles the runtime of the iPhone, with a built-in gauge to let nurses know when it's time to grab more power. With the push of a button, they can easily exchange for a fully-charged battery from one of Code's enterprise chargers, all without removing the iPhone from the protective case. Users can rapidly charge up to 10 batteries at a time so full power is always on-hand, and a variety of mounting configurations means chargers are easily accessible wherever they are needed. The CR7000 also comes with the essential tools that hospital IT needs for easy device management. BatteryTrak™ gives administrators visibility to the age of their batteries and helps them plan appropriately for replacements. Code Complete™ provisioning and deployment services are also available to help reduce the strain on internal resources. "As hospitals roll out their iPhone clinical communication strategy, they've typically settled for flimsy consumer cases to provide some level of protection to their investment," said Jennifer Braun, Mobile Program Manager. "Code has packaged decades of healthcare technology know-how into the CR7000, so now hospitals don't have to settle." Code is a technology leader in data capture solutions and mobile technology. Code designs and manufactures a complete line of hardware and software solutions to enhance productivity and exceed customers' expectations for superior barcode reading performance, ergonomic design, equipment durability, and seamless integration with their operations. Servicing a diverse range of industries and environments, Code's products are used in critical applications in healthcare, public safety, manufacturing, transportation, retail, and a range of other diverse industries. Code's worldwide headquarters are located in Salt Lake City, USA, with regional headquarters in China, Singapore, and the Netherlands. For more information, visit www.codecorp.com. DragontrailTM is a trademark of Asahi Glass, Limited.